The Jewel Concert Baritone Sax mouthpiece is made from 100% pure hard rubber and hand worked at all critical points for exceptional playing response. The streamline style is more comfortable on the embouchure for the younger players. The concert Baritone mouthpiece is designed with a step baffle in the chamber which allows the player is increase volume and projection when needed. The Jewel Concert baritone mouthpiece is very controllable. Ligature included. 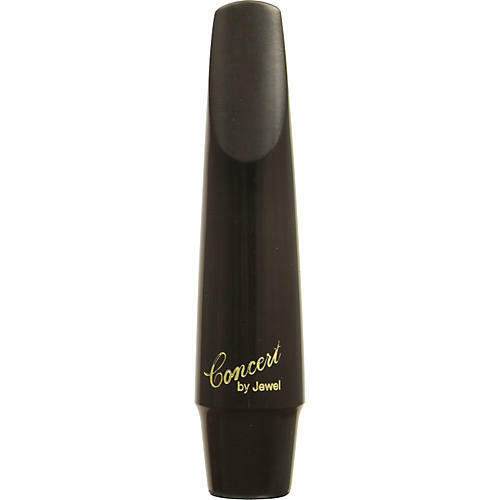 The Jewel Concert Series Baritone Sax Mouthpiece is an exceptional mouthpiece that is very versatile and suites the needs of professional players called upon to do a variety of work such as shows, recordings, classical or light commercial work. The Concert Baritone, with it's wonderful classical sound, is a great choice for concert or symphonic band.